What do five students, $1,000, and college have in common? If you guessed it’s time to apply for the 2019 Steinberg Law Scholarship, you were right! All high school seniors who plan on going to college next fall are welcomed to apply. Steinberg Law Firm takes pride in helping our community through various funds, outreaches, and scholarships. We are excited to support higher education with our yearly Steinberg Law Scholarship, a continuation of our 90-year legacy of assisting higher education. This helps students with extra costs associated with going to college. It is one of our favorite ways to help the coming generations realize their dreams of higher education. Ashley Rowell, attending Clemson University. Hunter White, attending Charleston Southern University. Alicia Wallick, attending Columbia International University. Britney Cano, attending Winthrop University. Dawson Hays, attending Clemson University. Applicants must be high school seniors who are planning to attend an institution of higher learning to receive a four-year degree. We look at many aspects when choosing which five students will receive this scholarship. School activities, special honors and awards, and community involvement all play a role in our decision. The greatest decider is the creative essay you will write. This year, the required 700-word essay should explain how you can play a role in the fight for equal justice under the law. If you would like to be considered for this scholarship, applications are now being accepted. Submissions will be accepted until April 20, 2019. Please fill out the form on our website and include your high school transcripts and 700-word essay. Recipients of the 2019 Steinberg Law Scholarship will be announced at each school’s year-end award ceremony. Here you will be invited to read your winning essay. If your school doesn’t have one, you will be notified no later than June 4, 2019. Payments will be made directly to your school on your behalf. We look forward to reading all the essays we receive from now to April 20, 2019. We wish each and every applicant the best of luck with their studies. 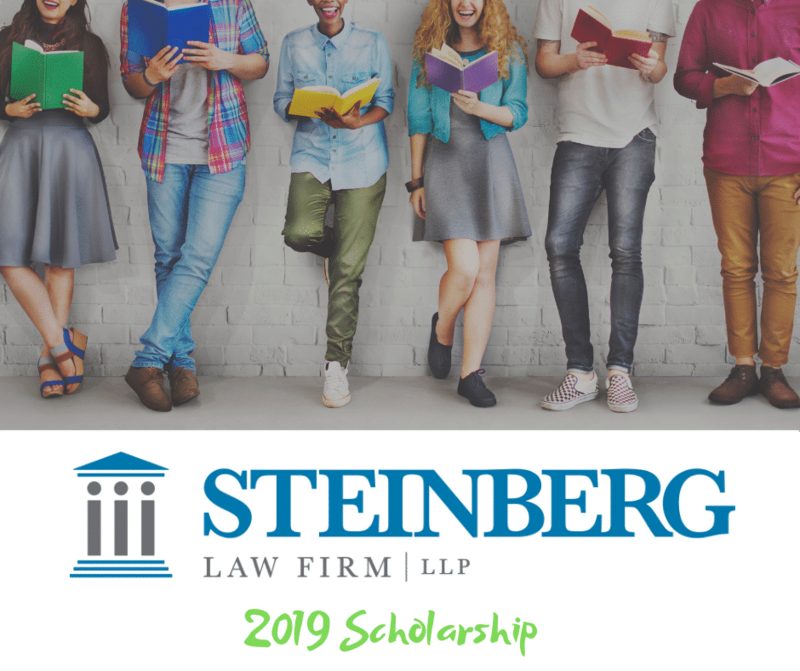 Click here to apply to the 2019 Steinberg Law Scholarship.